Here is the start of our Father's Day Event! Lugz shoes! Wait until you see these. They are called Revolt and they retail for $59.99. We ordered these for my husband! From the children of course! They are a perfect Father's Day gift. Great for Sport or Casual wear. Extremely comfortable. The Revolt is a fashion forward sneaker with a clean, stylish upper and a striking pops of color on the sole. 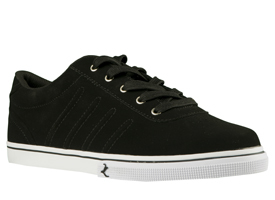 This sneaker features a cushioned insole and padded tongue and collar for all day comfort. My husband wore his Lugz on our trip to Chicago. He says they are very comfortable. He is sort of difficult to please with shoes, as they have to fit right and feel good, as he is on his feet alot. I know he likes his Lugz Revolt! We chose the black so he can use them for both sports and casual wear. They do come in a few other colors. What dad wouldn't like to receive a nice pair of shoes for Father's Day! You can purchase Lugz on their website. You can also find Lugz on Facebook and Twitter. 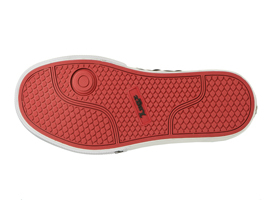 Now be sure and enter our giveaway because one neighbor will receive a pair of Lugz Revolt shoes. Disclosure: I received no monetary compensation for this review. I did receive a pair of Lugz Revolts for review purposes. All thoughts and opinions are mine. I'd also like to try the Drifter Lo Steel Toe work boots for my husband on his job. I also like the Men's Zrocs-DX in White and Black. I really like the Voyage! I like Lugz's Wisp women's boots. The Strutt Lo W/Strap in black is something my fiance would like. the Men's Zrocs-DX in White and Black. THE LAUREL IN BLACK ARE NICE !! I like the rickshaw in dk taupe/gum. I like the Dash SR Black Leather. I like the womens Zen Lo boots. I like the Roller Lo, I think my hubby would like them. I love the Drifter Fur Women's. I like these for my son. I wish they had them for women but they don't and my feet are far too small for even the lowest size in men's. I really like the Tambora boots! The Strutt Lo W/Strap is amazing! The Tambora boots in black are my favorite..I would have left a link but for some reason your website never lets me paste anything...meaning I can't copy from another website and paste to this comment box. I like this pair of shoes. I like the Drifter Lo Steel Toe work boots too! http://www.lugz.com/shop/mens/drifter-lo-steel-toe-eee/MDLSTEN-751 very nice work shoes! I would like to try these for myself. I like these Lugz Roller Lo Shoes in Deep Indigo/White. The Laurels are really cool looking to me!